Millions of Chinese travelers were caught in the boomerang effect as this year's Spring Festival holiday started winding down and the second travel peak heated up on Wednesday, with clogged highways, packed trains and soaring airline ticket prices. As people rush back from their hometowns to get to work by Friday, some 11.8 million trips were expected to be made on China's railway network on Wednesday, up 7.6 percent year-on-year, according to a statement sent by China Railway to the Global Times. The railway system will add 1,091 trains to meet the travel demand, the statement said. Motorists trying to return to big cities such as Beijing and Shanghai are expected to face the worst travel woes. 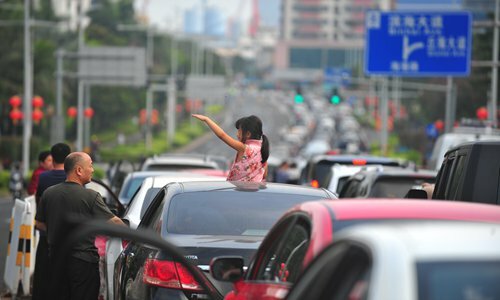 Around 1.13 million vehicles traveled on highways near Beijing from midnight to 4pm on Tuesday, up almost 3 percent from Monday, Beijing Youth Daily reported. More than 550,000 railway passengers arrived in Beijing on Tuesday, and the number is expected to increase in the coming days, said the report. Some 450,000 passengers arrived at Shanghai's railway stations on Tuesday, the Xinhua News Agency reported. The Beijing government increased night bus services to help late arrivers on the last leg of their trip home. Additional police were also on duty to ensure passenger safety, said the Beijing Evening News. While most of those who took trains and planes managed to get to their destination in a more or less timely manner, people traveling by road spent hours in traffic jams. During the first nine days of the travel rush, which started on February 1, some 653 million travelers traveled by road, said the People's Daily. "We started off from Beijing to Shanghai on Monday morning, but now we are stuck on the highway in Jiangsu Province," Shanghai resident Dong Tongjian told the Global Times. He said the trip between the mega cities usually takes 14 hours. "But there was a lot of traffic in Jiangsu Province. We only managed to drive 200 kilometers in 13 hours," said Dong, adding that finding something to eat has added to his frustration. "Traveling by road during the Spring Festival travel rush is a bad choice," Dong admitted. "There weren't any instant noodles left to buy even though prices had jumped from 5 yuan ($0.79) a packet to 20 yuan. They even charged one yuan for boiling water," Tang Jiayou, a Chengdu resident who had stopped at filling station on the highway on the way back to Chongqing, told the Global Times. Meanwhile, people who enjoyed the tropical climes of South China's Hainan Province got a nasty surprise when they tried to book an airline ticket. Luo Mengyao, a university student in Beijing, told the Global Times on Wednesday that her flight from Hainan to Beijing cost 11,500 yuan, almost six times more than the airfare during normal travel times. The packed roads, fatigued drivers and anxious passengers have caused a number of terrible accidents. "People's eagerness to get where they are going leads to overloaded vehicles and speeding, which are the main causes of accidents," an official from Chongqing traffic bureau, surnamed Wu, told the Global Times. A road accident in Ningdu county, East China's Jiangxi Province, killed 11 people and injured 20 injured after an overloaded bus failed to make a turn and skidded off the road on Tuesday, Xinhua reported.